Kendra Stanton Lee bought her first car, a blue Subaru Outback, in order to move her family from Boston to Chattanooga, Tennessee. The Outback has clocked 110,000 miles since that move five years ago. The Outback is a workhorse; there are inexplicable teeth marks on the inside of a passenger side door. 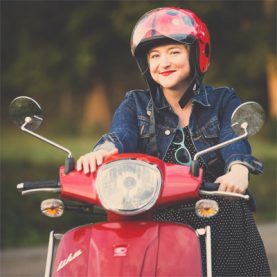 Kendra's husband John purchased a red motorscooter for his commute; Kendra absconded with it for her author photoshoot, their scenic city in the backdrop. She writes about the scenery and its characters from www.kendraspondence.com.